LUGU is a new storytelling card game from Modiphius Entertainment. It has the familiar scoring mechanism where a player gets points only if some but not all of the other players are able to match cards. 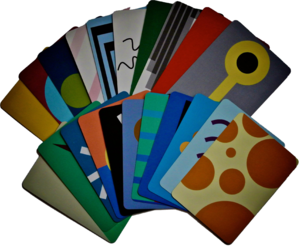 What’s different, though, is that the cards from which the players are supposed to derive their stories only feature abstract images.